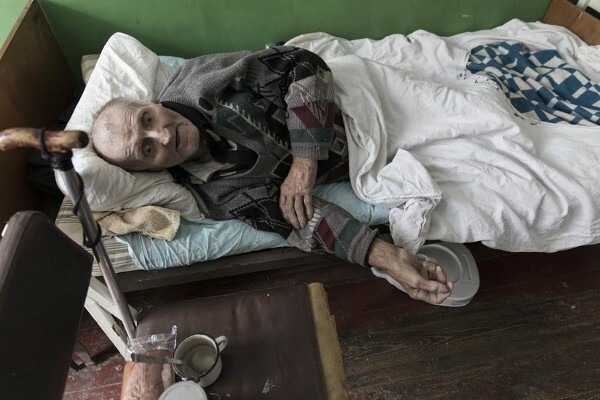 Are Ukraine’s war weary pensioners lost and forgotten? 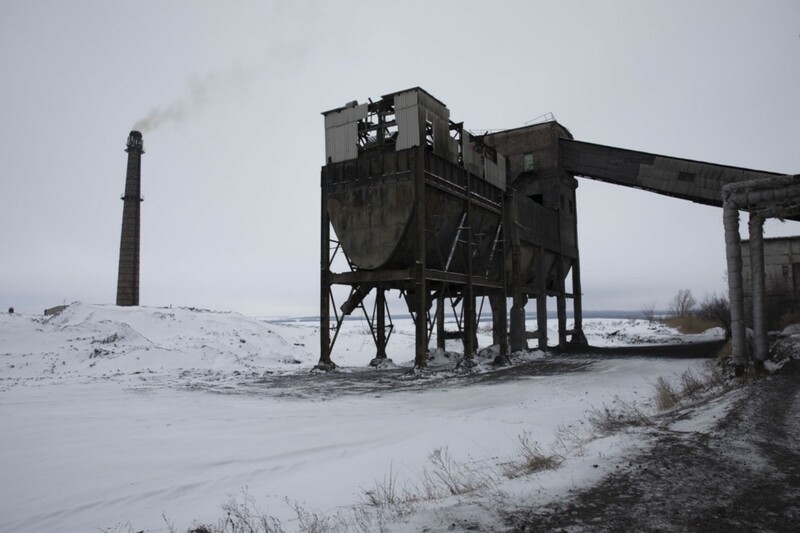 There is no doubt of the suffering in Ukraine’s Donbas region. Consumed by much more than conflict, its problems still exist no matter how long the world looks away for. It is winter, and inside the town of Novhorodske, a small assembly of people crowd around a Red Cross volunteer who is heating the room with a small oven powered by branches cut from trees in the town. Logging is illegal; coal mines are nationalized and its product sold to private corporations leaving many foraging materials for fuel. 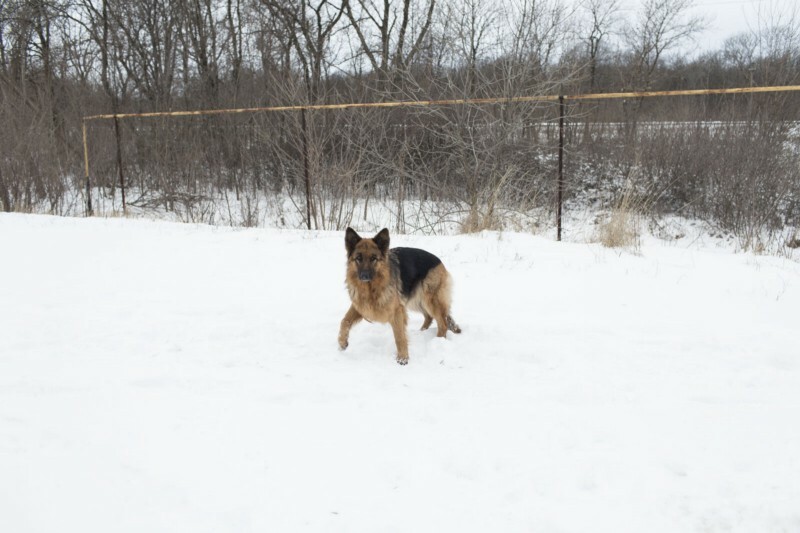 Nadiia remains in the town of Opytne looking after pets of neighbors who have since left. Wafts of cold air escaping my breath perfectly illustrated the severity of the cold. 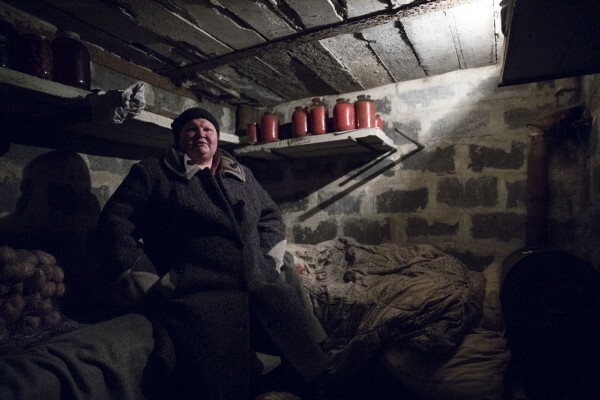 For Donbas residents, it is an ever-growing danger, especially without sufficient heating. Many visitors to Ukraine quip it has two seasons — summer and winter, reaching temperatures as high as +35 Celsius to as low as –20 Celsius. Iryna stands in her home void of all her possessions. Iryna takes me to her home barren of its content and what happened here is obvious. 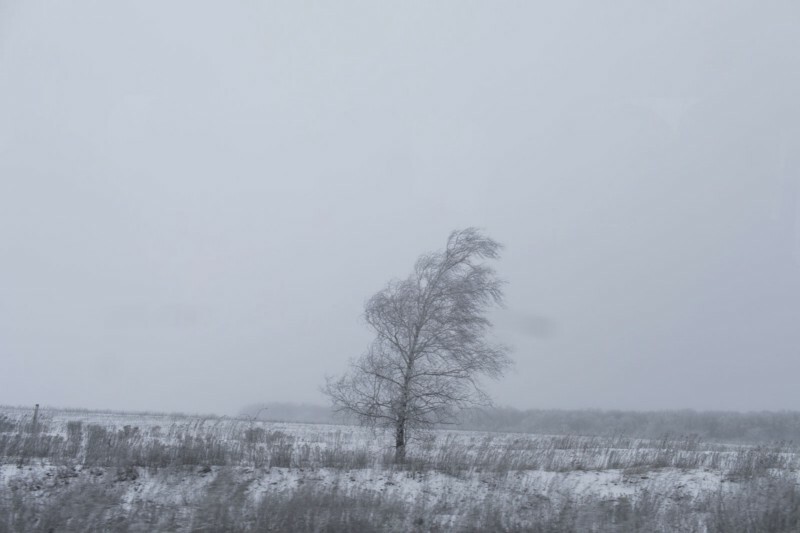 Many people migrate as internally displaced people, but Irina remained in town where snow covers park grounds and landmines remain hidden. Children’s play areas remain central to Novhorodske and when it is time for school both parent and child remain sharp to navigate around them. A stray dog waits near a checkpoint in the Donbas region. Animals have proved useful in alarming checkpoints. Town by town it is evident this conflict affects the elderly most. Many young people become estranged from their native towns taking on the title of IDP, but for pensioners, staying is a simple yet dangerous answer according to Vartan Muradian of UNHCR. Near the line of contact in Karbonit. Talk to Ukrainians and it is evident the spirit of its history is well and truly resurrected, but ambiguity still squeezes fresh progress. On occasion, derogatory remarks can be heard made towards Russian people from Ukrainians and no doubt the same can be heard from the other side of them. Not long ago, a woman living in separatist-held Donetsk, Iryna Dovhan, was tied to a lamppost in Donetsk and beaten accused of being a spy. But many Russians have defected to fight alongside Ukrainian battalions offering their services as volunteers delivering aid to a province in peril and vice versa. 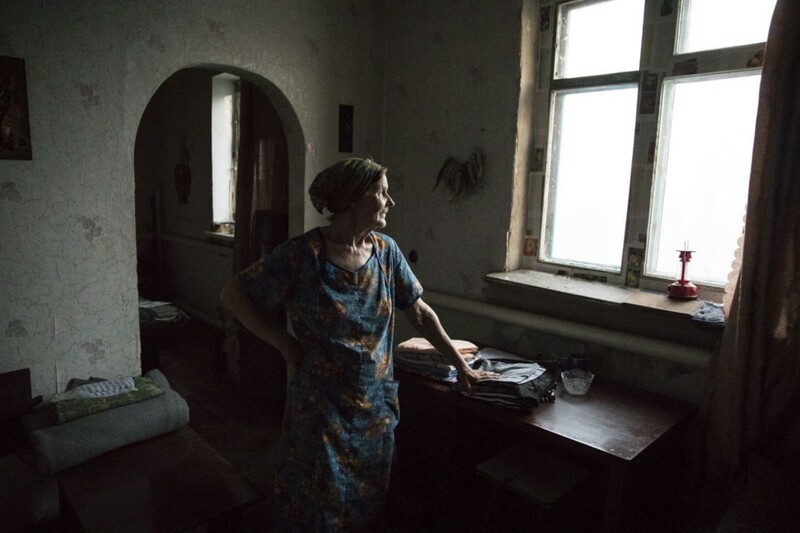 In war bitten east Ukraine, the reality of its plight is truly a nightmare. Like many conflicts, the situation here is far from black and white and though it is easy to wear a pair of good vs evil goggles inside the country, outside this mindset overlooks the conditions of those who live here. 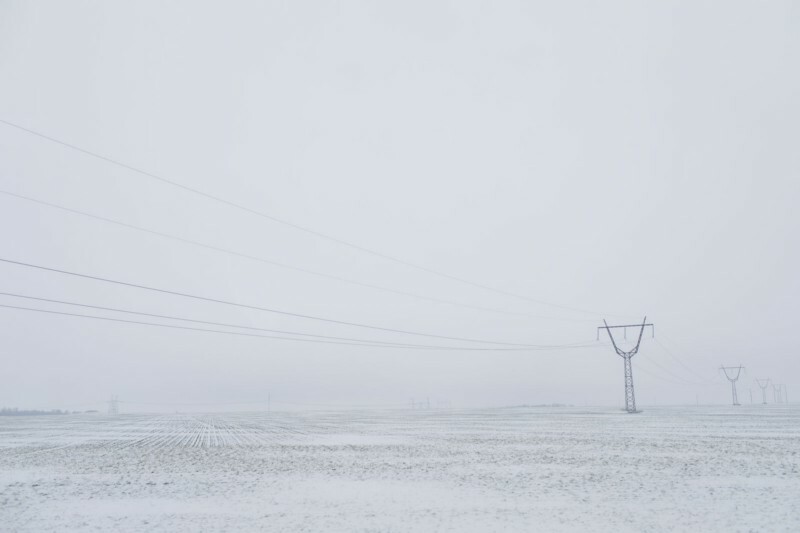 Visibility during winter months causes havoc for civilians. Post-apocalyptic is a word best used to describe this place. Not for its crumbling buildings hit by shelling and rocket fire — but the scarcity of people who wander the streets without verve like in Kyiv. Moving closer to the LoC (line of contact) we head for the town of Avdiivka where we meet Lebedev Rodion, who drives me on the back of a moped to his village — Opytne. Whizzing through green conduit lands to gain access we arrive at his home, which, barely standing is still a home. His family recently renovated the house which fortunately stood its ground to rocket fire exchanges between the two sides. 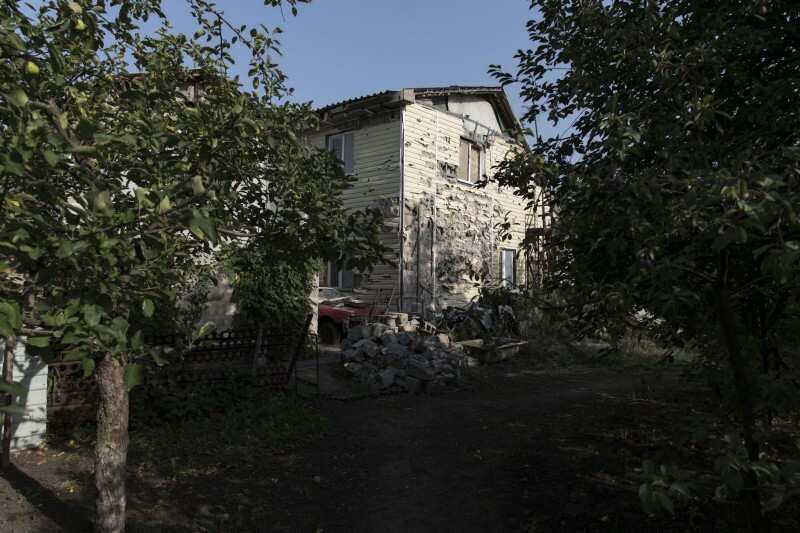 The outside of Lebedev’s home. 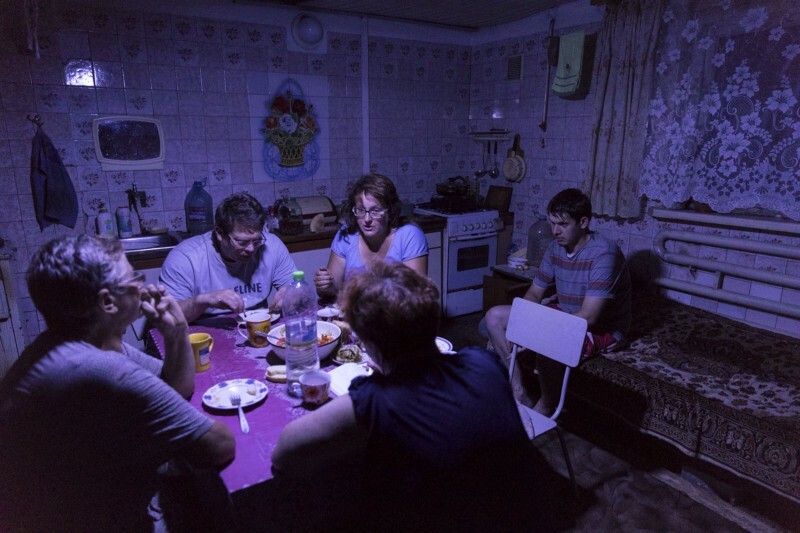 Lebedev and family have dinner under a solar powered light as the fighting begins nearby. Many fear the night staying enclosed in their cellars during daylight hours. Those who remain unwaveringly do so tending to pets of residents who left due to the town’s proximity to fighting. 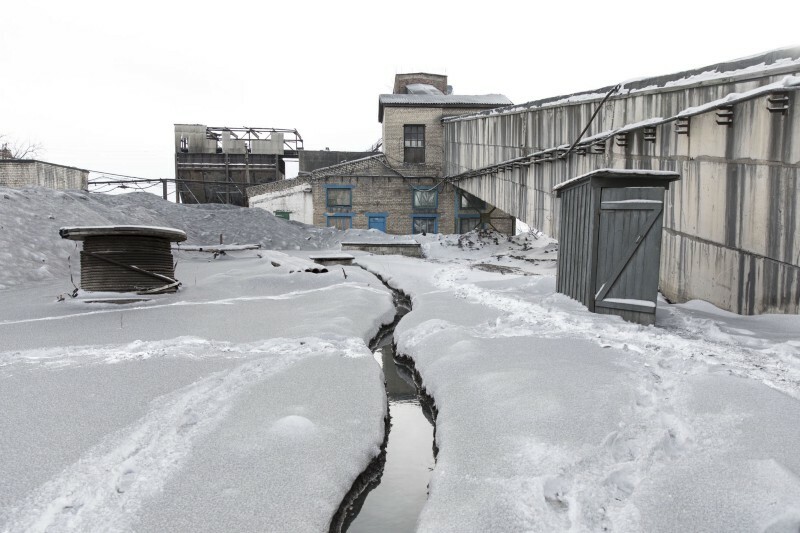 At times, fire is drawn to villages (on both sides) hosting troops, leaving villagers with devastating consequences and decisions to contend with come winter time when temperatures can plummet as low as –17 Celsius. Telichko sits in her basement surrounded by jarred jams, vegetables and jellies before the fighting begins. So, what is it like for residents living here? 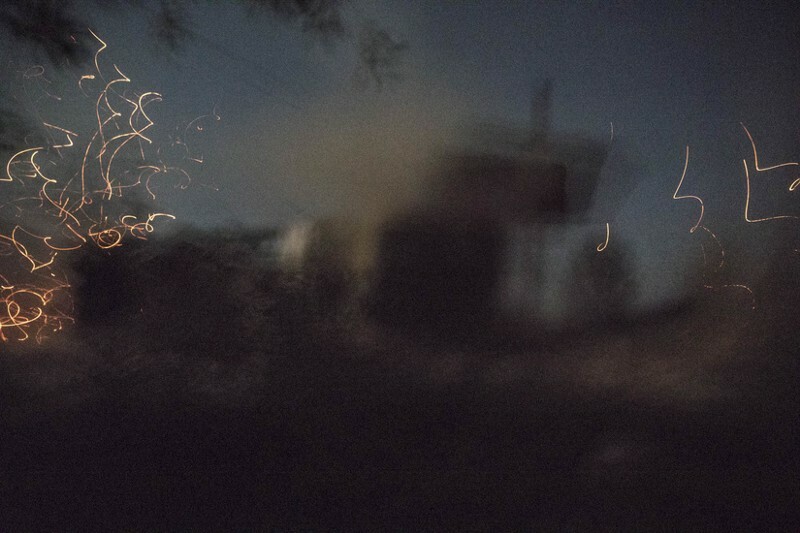 One night in August 2017, I sat in on a shift with Ukraine’s Donbas battalion who were posted on the line of contact. Beginning at 18:00 they sat talking about friends, relatives, and current affairs. In the distance, shelling can be seen, and the sound of bombs pound the ground. Each side retaliates until at 19:30 we are attacked ourselves by shelling. The sound of whistling shells like fireworks above compels the battalion to respond with SPG rockets. At such close range, you can equate the feeling of this weapon igniting to being hit by a wall. A very large wall, that does not break. 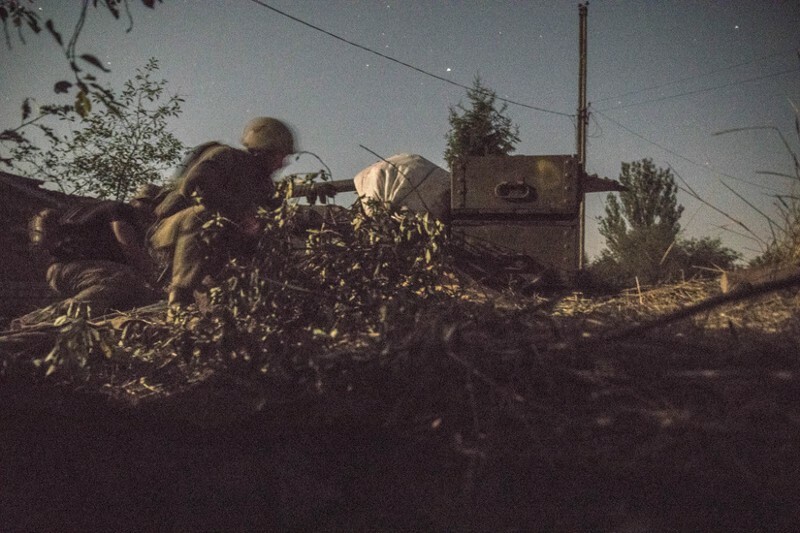 Ukrainian troops prepare to return fire. 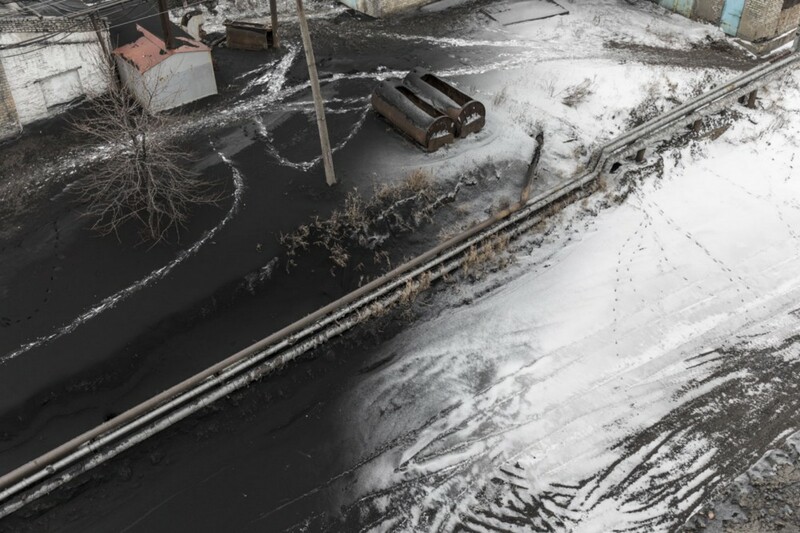 Snow is covered by a layer of soot in a mining station in the Donbas. Assumptions surrounding the war causes much confusion. Misunderstandings and conspiracies misconstrue the truth of the matter from claims of western coups and Nazi control of Kyiv souring internationally important grassroots calls to action. The nature of the conflict itself is complex and such assumptions gestate notions to forget the true victims of the conflict — its people and their rights. An elderly man remains in a retirement home without care from family. He adds that it is easy to obtain statistics for the elderly but confirming how many remain is more difficult. Uncertainty grows throughout the country, but nowhere is as tentative and fearful as those who live in Donbas. They have nowhere to go, no one to trust and must rely on volunteers and NGOs delivering aid to Donbas, with little they can do for themselves. Article and photographs by Ty Faruki. 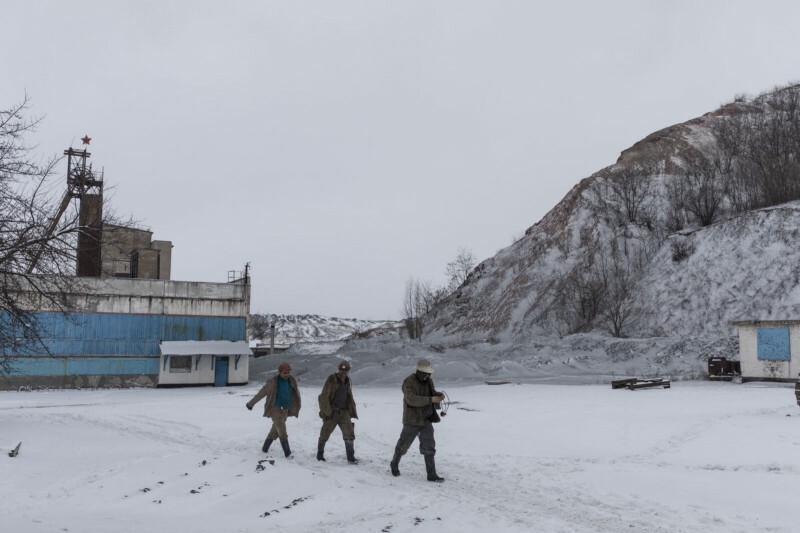 Best known for his work in Ukraine, Ty Faruki offers a different perspective on the realities of life and culture in the eastern European state.Following a brief moment in film, he pursued a passion in photography seeing it as a better way to document. Ty has been published internationally in newspapers including the Irish Times and Financial Times. 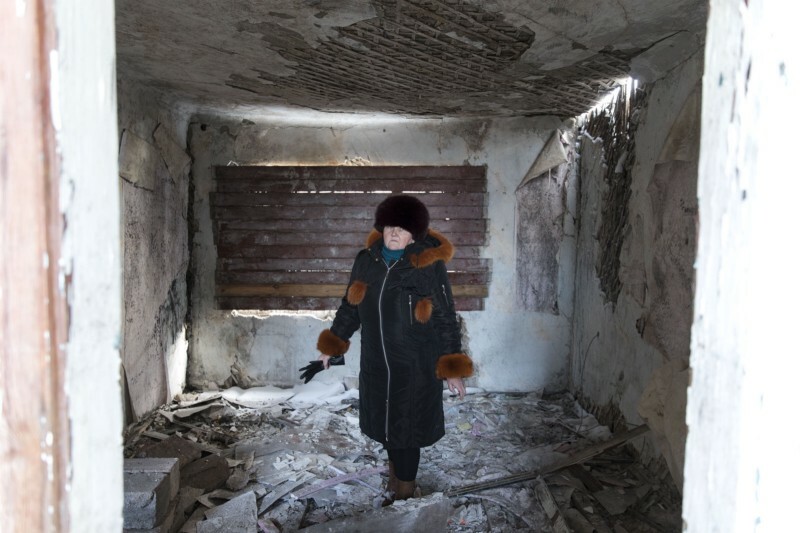 Source: Are Ukraine’s War Weary Pensioner’s Lost And Forgotten?